You must be imaginative, strong-hearted. You must try things that may not work, and you must not let anyone define your limits because of where you come from. Your only limit is your soul. I can’t believe how fast this year has gone by. It’s already September and I think back and realise how much has happened! Being away from home for four months, you get to learn a lot about yourself and other people. Your priorities take a slight shift and you adapt to find a different side of yourself. You learn to be adaptable and to try new things out, that you’re no longer in a familiar routine. I often stop myself from trying new things and going places out of the ordinary because I’m afraid I won’t enjoy it, or I won’t do a good job. But since travelling and being in situations I’ve never been in, I learnt that it’s important to step out of your comfort zone and try new things. No matter the outcome of what happens, you’ll always learn something. You might find out you have skills you never knew you had or you might find some new activity you really enjoy. I had four months of no baking. Out of all the things I thought I was going to miss, I didn’t think baking would be one of them. I came back and I couldn’t wait to return to the kitchen and turn sugar, butter and flour into something delicious and magical. But I didn’t know where to start! I had never been any good at decorating cakes and have always avoided it as much as possible. I would bake cakes that didn’t need icing and avoid cupcakes at all costs! Having come back from America, I learnt that I should put my best foot forward and give it a go, I went ahead and tried my hand at decorating. 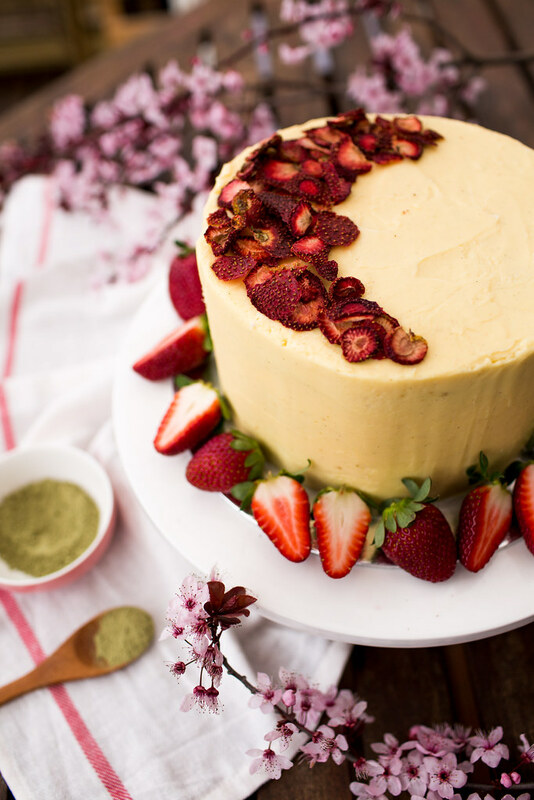 I baked a matcha cake, covered in white chocolate icing with hints of strawberries between each layer. I wanted to create something I had never tried and see if it would work out. 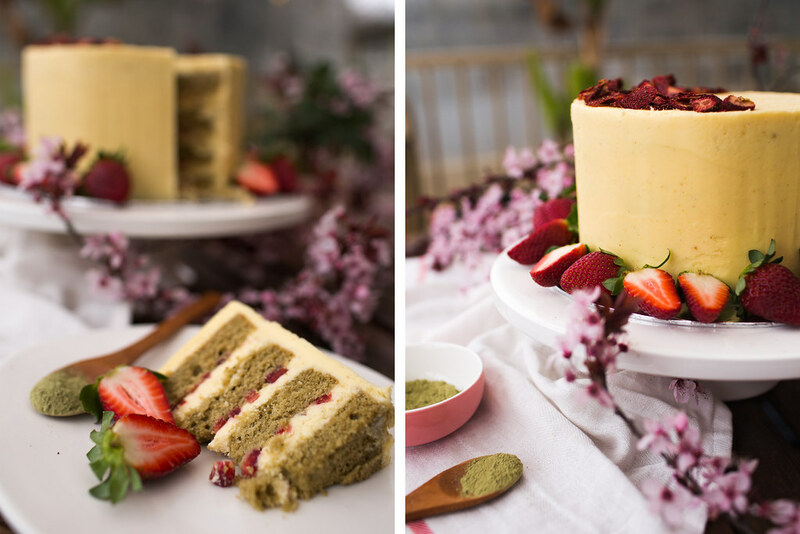 The matcha brings a subtle taste, paired with the sweetness from the white chocolate and the fresh hint of strawberries. It turned out better than I thought, and I even surprised myself! Although it isn’t perfect, and I didn’t get it on the first go, I gave it a go and tried something new. To make ganache, place white chocolate in a bowl, set aside. Place cream into saucepan, over low-medium heat, bring to a boil. Immediately pour cream over white chocolate. Cover with plate or plastic wrap and let sit for 1 minute. Remove cover and whisk till fully melted and smooth. Place plastic wrap directly on the surface of ganache. Allow to set overnight at room temperature. Place ganache into bowl with whip attachment. On medium speed, add in 150 g butter at a time. Turn off mixer, add in vanilla bean paste and salt. Mix on low speed until the buttercream is smooth. Preheat oven to 180 degree C. Prepare two 23 cm cake tins. Cream butter, sugar and oil together. Add eggs one at a time, mix well after each addition. Mix in milk, vanilla extract and milk into butter mixture. In a separate bowl sift flour, baking powder and salt. Beat dry ingredients into butter mixture. Divide mixture evenly into prepared tins. Bake for 20 – 25 minutes or until skewer inserted comes out clean. Cool cake tins before flipping onto cooling rack and icing. Level out both cakes, then divide each into two, to get four layers in total. 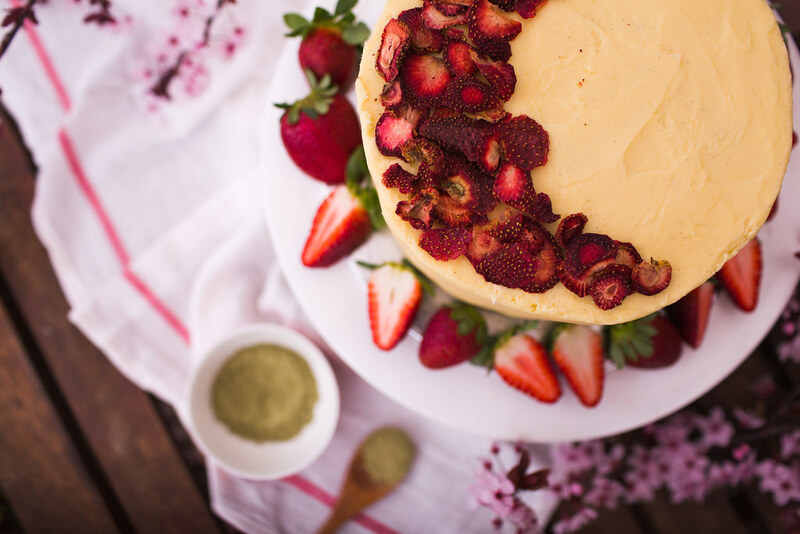 Spread icing onto first layer, then sprinkle over the fresh diced strawberries. Repeat between each layer. 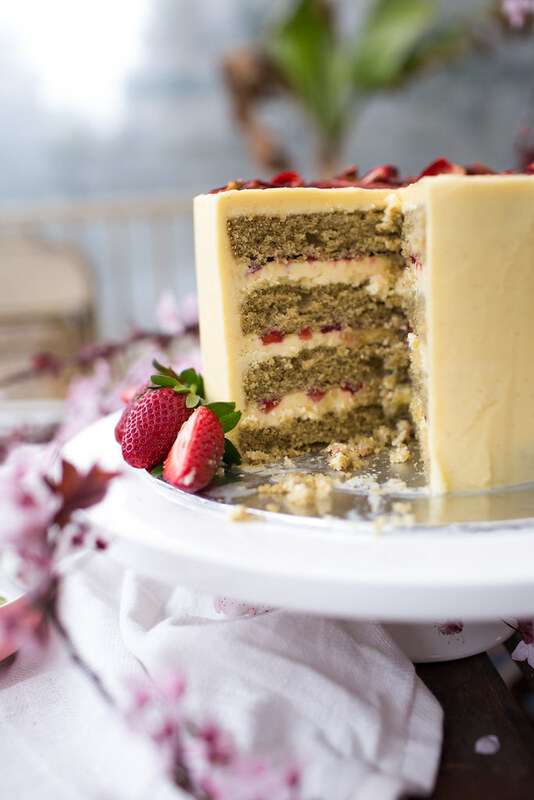 Spread icing around the cake, to complete a crumb coat. Place in fridge for an hour to set. Finally, do one more coat of icing. Chill until ready to serve. Viv this looks amazing!!! and your photography skills are next level, I bet it tastes amazing! Thanks Hati!! You’ll have to come down to Australia to try it!